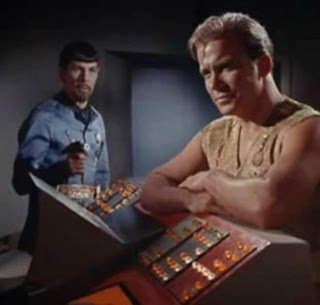 There's an old Star Trek episode (Mirror, Mirror) where a problem with the transporter puts some of the crew in a parallel world. In this parallel world the Federation was run by barbarians. Never mind that it was an impossible coincidence that the same set of enterprise crew would be beaming up from the same planet at the same time -- the episode made the point was that it was easier for civilized people to act barbaric than the other way around. In a way that is true about Single and Coupled people. Couple People can usually separate for the evening and hang out with single people, but single people start to break out into hives when they are surrounded by couples for too long. On the other hand, Coupled People usually have to check with each other about everything. Maybe it is easier for Civilized and Barbarians to hang out together. While I still speak Single, I'm transitioning into the World of Coupledome. Meanwhile some of my friends are making the reverse trip, going through divorce or breakup. One particular friend is Hanna. When we met a decade ago at the No-Name Software Company, neither of us was married, but we were not part of the same world either. She had been dating forever the guy who would eventually become her husband. We got along well enough and have been friends ever since, but neither of us really understood the other's world. Now our worlds are reversed. Soon she will be speaking Divorce, a cacophony of Jaded. Meanwhile, I'm well on my way to emersion in the language and customs of Coupledome. When I was single, I had no trouble finding something to do most nights of the week, and more importantly, someone to do it with. Thursday was the new Friday and If you knew where to look, you could find a social event as early as Tuesday. Friday nights usually had many options and Saturday nights were often triple booked. But alas the loneliest night of the week was Sunday. Sunday was reserved for people who had someone. It's not that i couldn't find anything to do, there was always church and usually a social afterwards. But it seemed like i had to put more effort into it. Now it seems I've traded my Sundays for Fridays. I have someone to spend all my Sundays with but I do spend a lot of Fridays and Thursdays and other nights of the week without anything to do. I'm a nurse's widow since Nightingale works the late shift.